Kuliyapitiya is the second largest town in Kurunegala District, North Western Province, Sri Lanka, governed by an Urban Council. 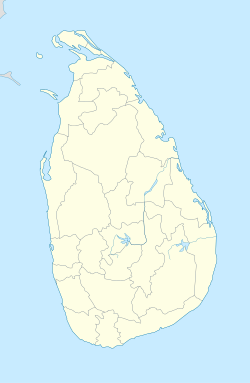 It is located 82 kilometres (51 mi) north-east of Colombo. Kuliyapitiya is home to the Wayamba University of Sri Lanka. Coconut and paddy cultivation are the main economic activities in this area. The town centre includes commerce and retail enterprises. The Kuliyapitiya bus station provides transport to and from other locations in Sri Lanka: Colombo, Jaffna, Gampola, Anuradhapura, Nuwaragala, Katharagama, Kalpitiya, Panduwasnuwara to Colombo via Kuliyapitiya, Kuliyapitiya to Puttlam via Nikaweratiya. Other bus services go to Kurunegala, Negombo, Pannnala, Chilaw, Hettipola, Madampe, Bingiriya, Katupotha and Makandura. Education is delivered free of charge to all students of national schools, according to the government policy. These schools operate under the Provincial Council. There are also a number of privately owned schools. Wayamba University is the thirteenth national university in Sri Lanka and is located in Kuliyapitiya. It was established in January 1999. Its main purpose is to offer English degrees, diplomas and certificate courses (both internal and external) in areas such as agriculture, engineering and management. According to the 2001 census data, the estimated population of Kuliyapitiya was 14,201. The male population was 7,126 and the female population was 7,075. Most of the Kuliyapitiya residents belong to the Sinhalese majority, other ethnic minorities include the Sri Lankan Moors, Sri Lankan Tamils, Burghers and Malays. Following Table summarizes the population of Kuliyapitiya according to different ethnicities. The climate in Kuliyapitiya is fairly temperate and tropical throughout the year. However, during April the temperature can rise to about 35 °C (95 °F). The only major change in the Kuliyapitiya weather occurs during the monsoons from May to August and October to January when heavy rains can be expected. In general, temperatures during late November to mid February period are lower than the rest of the year. The main heritage sites around Kuliyapitiya include the ancient Kebelawa (Buddhist) temple and dewala, Panduwanuwara temple and ancient city, Angomuwa ancient Buddhist temple. The Kebelawa temple is situated at one end of Kuliyapitiya, whilst the Paduwasnuwara ancient city is near the Chilaw-Kuliyapitiya road, close to Hettipola. The Dandagomuwa Ancient temple is near Kuliyapitiya.